Imagine achieving something incredibly special on the biggest stage of your respective field and ultimately getting overshadowed by an unnecessary incident. That'll put you in Naomi Osaka' shoes. The 20-year-old Japanese became the first from her country, male or female, to win a singles Grand Slam title. She should've been the darling of the tennis world after her historic win. Instead, all the discussions and threads are filled with Serena Williams' spat with chair umpire Carlos Ramos. Osaka, one of WTA's brightest youngsters, had the match in her control right from the first point. She took the first set 6-2. But it was in the second set, that things started to happen. Serena Williams was given a code violation for receiving on-court coaching from her coach Patrick Mouratoglou. It was more due to Mouratoglou's hand and facial gestures than Serena's. A lot of players actively get on-court coaching, and if the umpire finds out, they do get warned (or, penalized if it's not their first code violation). The same happened with Serena. It wasn't a smart move from Mouratoglou for sure, but it was probably more a matter of wrong place at the wrong time. Nonetheless, Serena understandably was agitated at the decision. Minutes later, Osaka broke Williams' serve twice to gain a lead in the second set as well. Serena didn't take it well. She broke a racket to receive a second code violation - resulting in a point penalty. The second penalty is what led to the explosion in Serena's on-court demeanour. She accused Ramos of indirectly implying her to be a cheat. She was adamant that Ramos owes her an apology because of what he did. Ramos didn't utter a single word throughout the incident when he could have. He could easily have tried to ease the situation and make Serena understand why he did what he did. Serena might not have hurled direct insults on his character after herself standing against the same. She hated being attacked on her character, but herself called him a "thief" and a "liar" for stealing a point from her. Serena's outburst isn't acceptable, for sure. But, what's worse was what followed. Her outburst garnered severe attention from an entirely pro-Serena crowd. The booing started at 6-2 4-3 in the second set. It continued until the end of the match and carried on to the presentation ceremony. The crowd kept booing when the Naomi Osaka's name was called as the 2018 US Open Women's Singles champion. It was an absolute mockery of the attitude that should be shown towards a champion. The crowd didn't accept the decisions involving Serena, and Osaka had to see her precious moment get ruined. It's understandable that there would be a massive backlash among fans if they think the home favourite is being unfairly treated. It's still understandable that they'd show her a lot of vocal support. But, did Naomi Osaka deserve any of that? The answer is rather easy. She didn't. She beat Serena fair and square without taking into account the point and game penalty. She dominated her idol throughout the match and played like the deserved winner. The fans weren't a good sport, to begin with, and hence they mourned a loss for Serena more than they cheered for Osaka. It was only after Serena asked the crowd to stop booing and give credit where its due, did they properly cheered for the Japanese. That brings us to a compelling question. 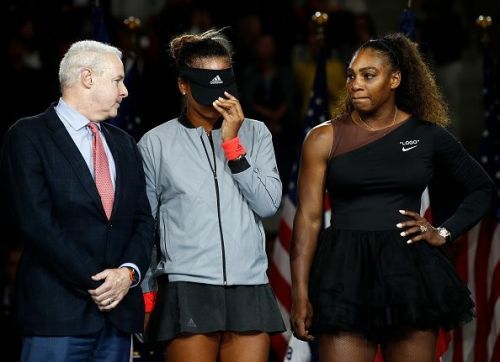 Could the situation have been otherwise, especially among the fans, had it been somebody else instead of Serena Williams? Yes, probably it would've been. Nobody in women's tennis is quite as popular in the USA, as Serena. Her status as modern tennis' biggest icon is undisputed and cashing in on that, the fans and the organizers made it all the more difficult for Osaka to celebrate her win. The hatred she's been getting on social media is unwarranted. All over Instagram, Twitter, and Facebook, her posts are being flooded with anti-Osaka comments. Most of them about her not being the deserved candidate for the title, and that apparently Serena was robbed off a record-breaking 24th Grand Slam title. A post-match statement from USTA President Katrina Adams on Williams' trophy acceptance speech, basically reverberated her words from the ceremony itself. She had a lot of words of acknowledgement for Serena Williams, which the American legend deserves every bit. She echoed the crowd's thoughts when she said that the end result was perhaps not what they were looking forward to. Surprisingly for Osaka, it was a simple, "Congratulations. You're a force of the future". Not quite what a first-time Grand Slam titlist would like to hear! The organizers could've handled the situation in a more professional way. Serena herself could've handled it in a less hurtful manner. And, most importantly, the fans could've been a little more positive about the whole incident, so that it didn't look this harsh on Osaka. Years later, this match isn't likely to be remembered as Osaka's historic first victory at a Grand Slam event. Instead, it'll probably be remembered as the one where Serena Williams got involved in an ugly row with the chair umpire. And, that's pretty much where Naomi Osaka has been robbed of her deserved winner's awe.